Just in time for flea and tick season, here is an informative article about keeping your dog safe from these sometimes dangerous insects, courtesy or Dr. Catherine Lund, DVM from the Animal Wellness Center. It's flea and tick season. 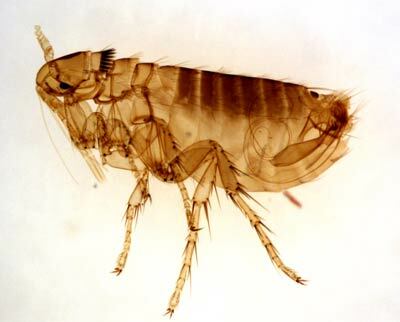 Fleas are more of an irritant than a danger to adult pets--though they can make very young animals anemic--but they are a pain to clean up in the house. Most pets get fleas from hunting or sniffing in rabbit burrows this time of year. Ticks do carry illnesses in Minnesota; currently five different diseases, not just Lyme Disease anymore. They can be very serious, so we do want to keep our dogs and cats tick-free as much as possible. It is important to note that the odds of getting sick from one or two ticks is not high. Pyrethrin: This is the ingredient name of an insecticide extracted from mums. I wouldn't use it as a beverage, but it is the safest bug repellent we have. A product with 100% pyrethrin would be ideal, although piperonyl butoxide is often added for quick knock-down, and is fine. Do AVOID permethrin, which sounds similar, but is much more toxic. Locally, Fleet Farm carries "Equisect" and "Gordon's Horse and Stable Spray," which are both okay. But there will be many other brands that carry only these ingredients; you just need to read labels. You'll need to reapply this product--daily during the heaviest part of the tick season (usually mid-May through June)--before walks in the longer grass, woods, etc. The rest of the year, ticks are almost non-existent, and you should need very little help. Garlic: This does seem to repel bugs to some degree, and many dogs like the taste. In recent years, it's been shown that too much can be harmful to red blood cells, so we give garlic in food at a maximum of one clove per 40 lbs. or so. I just mix it right into my dog's veggie blend. Brewer's Yeast: This nutritional product also may have some benefit in repelling insects. You can buy it (sometimes paired with garlic) from dog supply catalogs and websites. Some dogs are allergic, so watch out for itching or upset stomachs when you start it. Essential Oils: These plant oils can also be helpful; see recipes in Kristen Leigh Bell's book Holistic Aromatherapy for Animals. It can be expensive for good oils. Fresh diet, exercise, and play: These lifestyle factors play a BIG role in how desirable your dog appears to insects. They are obviously important to health in general. Our last Golden Retriever had fleas for the first time three days before he passed away, at age 11. Bugs know a sinking ship! Cats are a whole different story with insecticides; some that are fine for dogs are quite toxic to cats, so ask your veterinarian first.